This trendy style women leather dress is awesomely crafted from soft suede and lambskin leather. 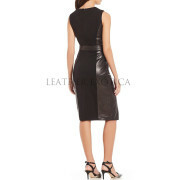 This women leather dress has back imported zipper closure and front V neckline and it classy on this dress. This is knee length women leather dress and it has waist knotted belt which look classy on this dress. This trendy looking women leather dress is available in sizes and all colors. The combination of suede and lambskin leather will make this dress more trendy and classy. So buy this trendy looking women leather dress right now and get a coolest trendy look.